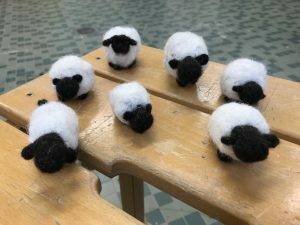 The latest animal team in our school is the sheep team, where students from grades 8 to 13 speak English while they care and learn about the sheep. 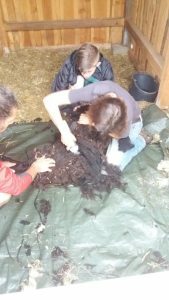 We have to change the water, refill the rack and clean the barn every day for the health of the sheep. Once a week we meet and we organize things with our tutors Kirsten and Heike. 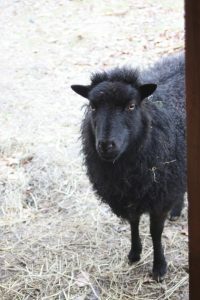 We also learn about the sheep, for instance how to defense against ram attacks and how the digestion of a sheep works. 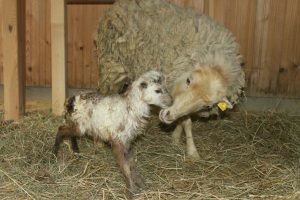 At this moment we have got four Ouessant sheep: Two black sheep called Ewe and Flocki and a white ewe called Clairchen with her lamb Chloé. They live in a great barn we built for them. They can walk through the whole Fachwerk and graze or eat some apples day and night. Ouessant sheep are from the island of Ouessant, off the coast of Brittany and they are bred for wool production. They are between 45 cm and 49 cm tall and normally have a black fleece. 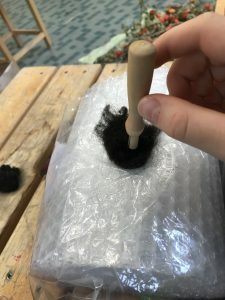 We shear the sheep, wash and dry the wool, comb the wool and then we felt little sheep.